The CRRNJ Terminal stands with the Statue of Liberty and Ellis Island as an historic trilogy. Together they offer a wondrous three-part story of the immigrant's first glimpses of, and experiences in, the New World. Of the 12-17 million immigrants that passed through Ellis Island’s Great Hall between 1892 and 1954, approximately two-thirds of these courageous newcomers started their new lives via the CRRNJ Terminal. The immigrants, upon arriving in New York Harbor, found themselves welcomed by the Statue of Liberty. Next, most were sent to be examined and processed on Ellis Island. Finally, the majority would take their first step on American mainland soil at the CRRNJ Terminal. Some of these new Americans settled in New Jersey, while others continued on to other parts of the country. 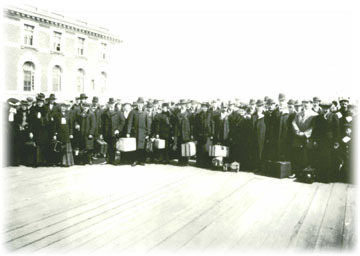 The immigrants would purchase their train tickets at Ellis Island, then board a ferry to the CRRNJ Terminal. Historically, the location where visitors now wait to board ferries to Ellis Island and the Statue of Liberty, was known as the Immigrant/Emigrant Waiting Room. This area usde to be within a building (the Ferry Shed) that was attached to the terminal. The immigrants would wait here for their trains, then proceed through the North Baggage Tunnel to their trains. Thus, the immigrants would avoid contact with the mass of commuters that used the terminal daily traveling to and from New York City.